Atlantic Canada could feel an impact from Tropical Storm Chris which has formed off the coast of the Southeastern U.S. The Canadian Hurricane Centre says the third named storm of 2018 will move northeastward and possibly strengthen to become a hurricane by early Wednesday. The storm could weaken as it approaches Nova Scotia by Thursday. The CHC notes there is still uncertainty in the forecast track and intensity of this system. Beryl is the second named storm but first hurricane of the season and has been down downgraded to a tropical storm as it heads toward Puerto Rico. Meantime, Environment Canada issued another heat warning for New Brunswick except the Fundy coast, Prince Edward Island and northern Nova Scotia as a warm, humid air mass pushes highs into the low 30s C with humidex values up to 38 on Monday. Tropical Storm Beryl closed in on the southeastern U.S. coast on Sunday, dumping rain and whipping up heavy surf from northern Florida to South Carolina. The second named storm of the 2012 Atlantic hurricane season is expected to make landfall with possible wind gusts to hurricane force, according to the U.S. Hurricane Centre. 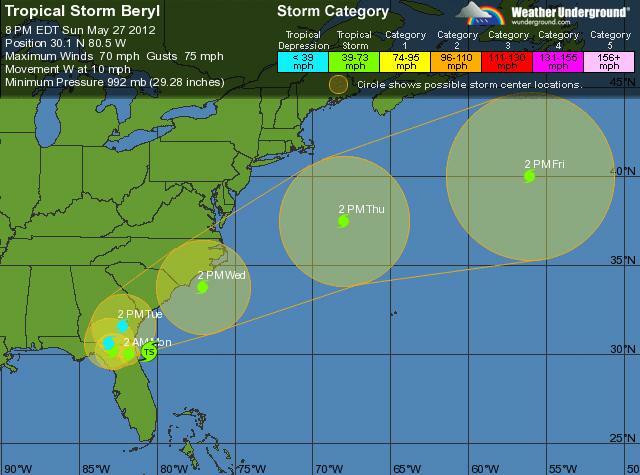 Computer forecast models show Beryl moving on an eventual path back out over the Atlantic after coming ashore, posing no threat to U.S. oil and gas installations in the Gulf of Mexico. Forecasters say it is expected to weaken to a depression by Monday night.